Lets say you want to allow your customers to have the ability to send themselves a mobile coupon they found on your website. To do this without opting in that customer to a specific campaign, you'll want to use our Transactional API. But what if you want to give customers the option to opt-in to a specific campaign, after they get sent their coupon via the transactional API? It's actually pretty simple, just instruct the customer in the transactional text message, to reply to that message with your campaign's keyword. See below for an example. We highlighted the transactional message in red so you can easily see it. 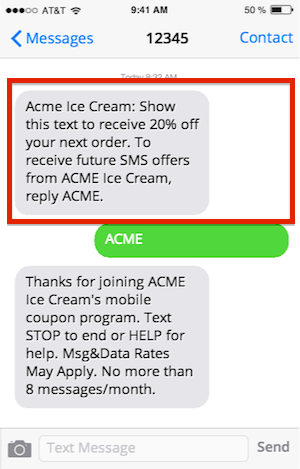 Don't want to cram everything into one message, how about sending two separate transactional messages, the first one being the coupon from the web, and the second being the instructions on how to opt-in for future messages. We recommend if you use this method to delay the sending of the second transactional message by about 5 seconds, just to make sure it comes after the message with the initial coupon in it.